Sure, America is a great country, but if you take the trouble to leave your neighborhood and travel to far off places, you will discover there are other great countries, too. If I rewrote my sentence above using a creative phrase from prominent and published Lakewood author, Susanne Bacon, my sentence might read: “If you are willing to ‘go over the fence,’ you may discover there are other great countries, too.” Wow, just writing like Susanne Bacon makes me feel more like a prominent author. Thanks, Susanne. Thinking it through, if America is already great, it would be impossible for our president to make America great again. If you agree with President Trump, that means America is not great right now. But there is at least one country I know of that is already great. That country is Ecuador including a special place known as the Galápogoes Islands. I know it is a great place because my sister, Peg Morgan, visited this paradise and sent me a photograph depicting one reason why Ecuador is a great country. Peg’s photo inspired me to generate another edition of my Sign of the Times writing and photo feature. As Peg made her way along the equator, she spotted a sign outside one of her favorite Ecuadorian restaurants confirming just what it takes for a country, any country, to be great in the first place or as the president suggests great again. Let this be a hint to President Trump. If President Trump can get members of Congress on both sides of the aisle (Mary, note my use of the word aisle vs. isle.) to work on a nonpartisan basis to reach a mutual agreement on America’s FREE BEER program then maybe, just maybe, America can become great again. It would be a productive move to serve FREE BEER during the Congressional committee meetings as Republicans and Democrats debate such a proposal and then again kegs of FREE BEER to lubricate the path of progress as they take the big vote. Reports have reached the White House indicating that I am rather prolific when it comes to developing top-notch solutions to problems facing America. Rumors are spreading that the White House wishes to recruit me to become a member of the staff. I know this rumor is spreading because I started it and am telling everyone I know. Once I reach the White House, I will have a new hat designed to replace President Trump’s red hat. For further details on my problem-solving concept, reference the prototype below. Let’s take another look at the bottom of the Ecuadorian beer sign. 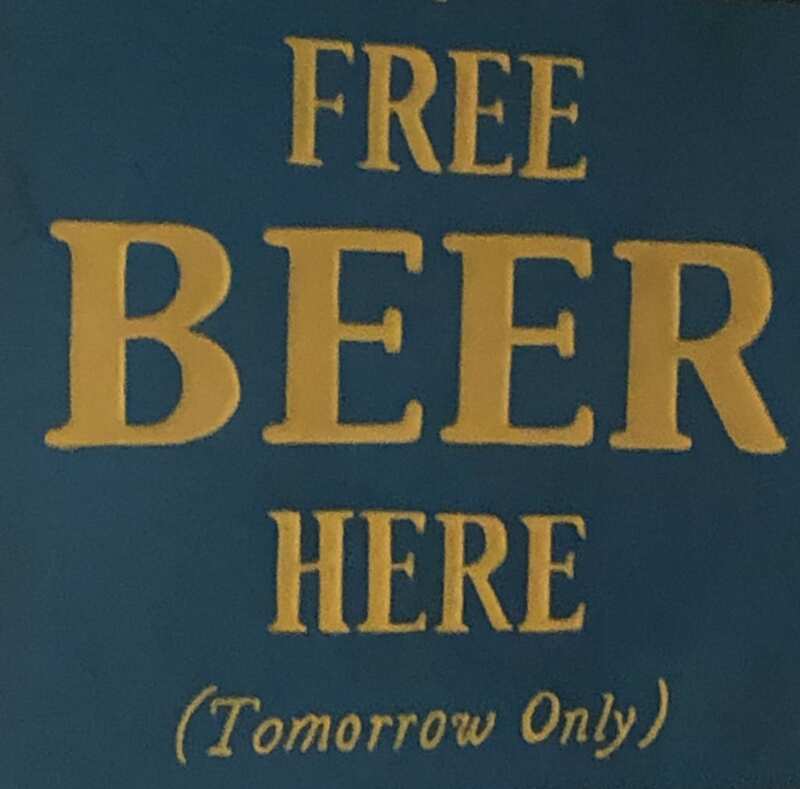 Is that bottom line, which reads “Tomorrow Only” an indication that Free Beer is just another politician’s empty promise? FUND-RAISER: For any readers who wish to purchase a custom America Is Great Again hat as shown above or a hat with a clever message of your choice which can replace Free Beer, contact me at The Suburban Times or submit a reply to this article requesting a hat. I will put my creative energy to work for you. The word Again in America Is Great Again is also optional allowing the bottom line to read, America Is Great. Price $35.00 including shipping, handling, tax, and any new tariff established by President Trump. All net proceeds will be donated to The Charles Wright Academy – Phyllis M. Boyle Endowment to help kids. Look at this way. 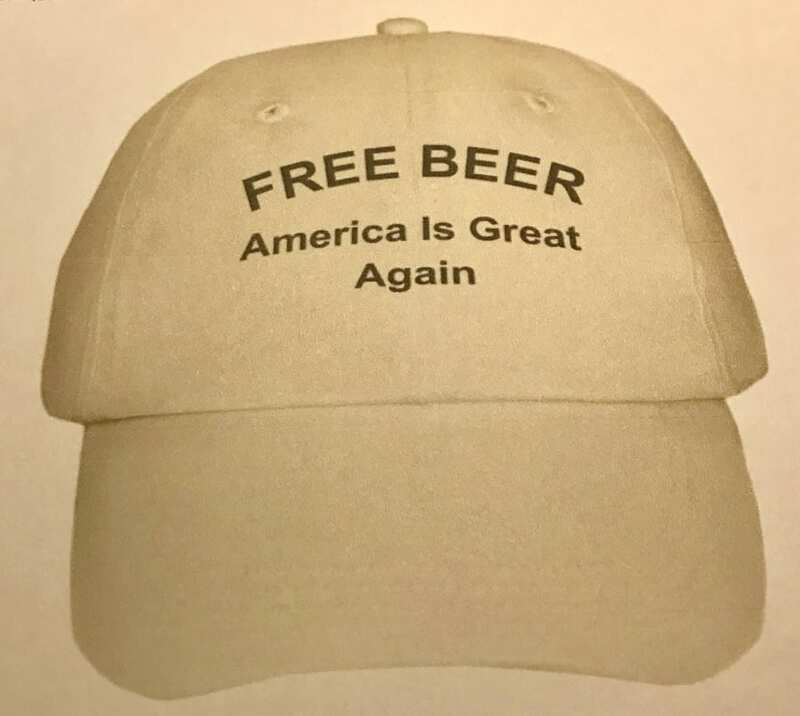 If you wear a Free Beer hat or a hat with your idea printed in place of Free Beer you are going to have some fun and laughs with your one-of-a-kind hat promoting America Is Great. Starting my day with a chuckle caused by one of your articles always feels good, Joe! Also, my dad used to tell me this “Free Beer” joke as a Bavarian one when I was a child. Ah, tomorrow is a great hook. And sometimes, when hopes are too high, a punch in the face. Meanwhile “Life is Great” (free beer or not), and I hope that you have a marvelous Valentine’s Day! Thanks for sharing your personal history related to my sister’s FREE BEER joke. I really appreciate your telling me my writing brought a chuckle your way. I would love to become a better writer so that my readers would need to wear a seatbelt before reading one of my humor articles to prevent injury from falling out of bed or falling out of a chair. Maybe I will get there. Right now I am learning and appreciate your positive comments. Since you obviously don’t like America’s presidential electoral process, why don’t you move to Venezuela, Iran, Saudi Arabia, Russia, etc. Please take Inslee, Pelosi, Schumer, Warren, Sanders, Ocasio-Cortez, the governors of California and New York, Ilhan Omar with you and do the rest of the country a favor. Thank you for your comment. Neither my article, nor I, have an opinion regarding our Presidential Electoral process, so what is obvious to you is not true for me..
What is true is back in 2016, out of all the good and talented men and women in America we were forced to choose between crooked slime-ball and a grandstanding, lying, sexual predator. You do have an excellent idea about your list of politicians. Perhaps with one roundtrip ticket for me and 9 one-way tickets I could drain America of all those who wish to destroy our U.S. Constitution and with it, America itself. Once I were to fly back to America having cleaned out the political cesspool, I would be thought of as a high flying American hero. Realizing my words will not convince you that I am not guilty of disliking our American system, rather than the particular results of our American system, I suppose this means you will not be purchasing a hat for my fund raiser. Your hat could read, DEPORT Pelosi, Schumer, Warren, Sanders, Ocasio-Cortez, Cuomo, & Newsom. – AMERICA IS GREAT AGAIN. Thanks for your comment and thanks for being a loyal supporter of the Republican Party. What a great hat idea. I am still laughing. Obviously this is the idea of a thinking man or should I say drinking man? I am heading out to my custom hat shop right now to get to work on your hat idea. Can’t you hardly wait for Robin at H.L. to see your new hat? Your suggestion for a hat is so good it could be made into banners on the sides of buses and other key visible spots across America. Go Joe! in keeping with the Ecuador sign.